Historians refer to the Blackfriars theaters as separate entities: the first from 1576 to 1584, the second from 1600 to 1640. Both were located at the southern end of the western range of the old Blackfriars friary, both involved some of the same space, though the second was considerably larger, and both involved most of the same directors and patrons, so although they are usually treated as separate ventures, it’s more realistic to see them as earlier and later developments of a single operation, one that has escaped all but a few orthodox historians, and even those have failed to see its true importance. According to orthodox historians, the first Blackfriars theater opened in 1576 entirely through the efforts of Richard Farrant, composer and master of the Children of the Windsor Chapel. As reported by historian Irwin Smith, it occupied a fairly small space (33’ long x 26’ wide) in the school he created for the choirboys whose purpose was to entertain the Queen and Court on holidays (143). 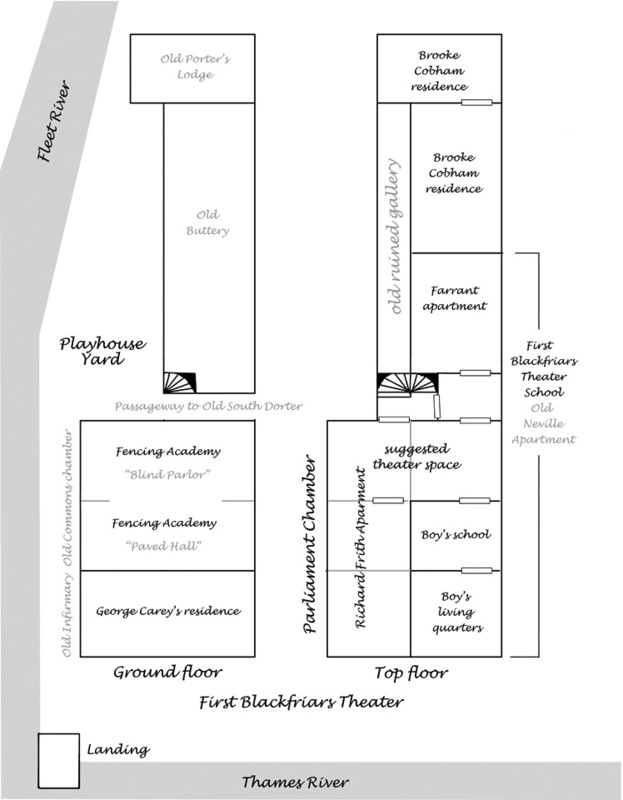 In his excellent book, Shakespeare’s Blackfriars Playhouse (1964), Smith goes into exhaustive detail on the school, its theater, their sizes, location and features. Although I rarely see his conclusions referred to by the historians who focus on the plays and their actors, I prefer to rely on Smith’s, based as they are on much fuller documentation. Anyone wishing to pursue this issue beyond what I have room for here should certainly study Smith’s book. This doesn’t mean that his conclusions can’t be questioned, for, as he admits, too much remains unresolved. Nevertheless his fact-based conjectures offer the most solid basis for the following scenario. While the theater/school was located (partially? totally?) in the long, narrow eastern half of the old Parliament Chamber, once used as a repository for Revels rehearsals and equipment by Henry VIII, the western half was occupied from 1561 to 1590 by Richard Frith, the Court’s dancemaster. Thus from 1576 until 1584, and possibly even until 1590, the entire Parliament Chamber, however Farrant and Frith may actually have divided it between them, was devoted to rehearsing musical numbers, singing, dancing and interludes (plays). Either because Farrant realized that he could make a little extra money by charging local residents to see dress rehearsals (as orthodoxy has it), or because the school, was, from the first, a front for a private theater where Privy Council patrons and their actors could reach the influential Westminster community––audiences began attending in droves. At least, that’s the impression we get from landlord Sir William More’s 1584 suit in which he described the school as a “continual house for plays” (467), a view supported by Stephen Gosson in his 1579 diatribe against the stage, School of Abuse, wherein he states that during the six years since its opening in 1576, there were “a great many comedies” performed at the little theater. We know for a fact that Oxford was involved with the little theater at Blackfriars because in his April 1584 deposition, landlord Sir William More names him as one who assumed responsibility for the lease (however briefly) during the period from 1580 on. We also know, if not for a fact then as close to a fact as it’s possible to get, that he was involved in the school from it’s very beginning and that it came to life in time for the winter holiday season that followed his return from Italy in 1576. Oxford’s involvement is also suggested by the program recorded in the Revels accounts for that holiday in that of the six plays performed at Court from New Year’s through Shrovetide, all anonymous of course, three are on topics dear to the heart of early Shakespeare, two others may be, all found either in Shakespeare or in Smith’s library. Jan 1: Error, possibly an early version of Shakespeare’s Comedy of Errors, performed by Paul’s Boys. Based on The Maneachmi of Plautus, it was available to Shakespeare only in the original Latin; Oxford would have known it from his early access to Smith’s library. Jan 6: Mutius Scaevola, performed by a combined company of the Children of both the Chapel and Pauls; the story of an ancient Roman hero of the sort that Shakespeare likes to portray in his early plays. The story comes from Livy, also in Smith’s library. Feb 2: Cynocephali, (“The Dogheaded Men”), performed by Sussex’s Men, (Lord Chamberlain Sussex was in charge of the Court stage); about the legendary monsters described in a book by St. Augustine; Smith had his complete works. Feb 17: A Solitarie Knight, possibly an early version of Timon of Athens, performed by “Howard’s Men” (Charles Howard, later the Lord Admiral and patron of the Lord Admiral’s Men). Timon is based on works by Plato, Plutarch, Strabo and Lucian, all of which are listed in Smith’s library. Feb 18: The “Irish Knight,” (no perceptible connection to Oxford), performed by Warwick’s Men (Ambrose Dudley, Leicester’s older brother, was patron of an acting company). Feb 19: Titus and Gissipus, performed by Paul’s Boys. A story from Bocaccio’s Decameron, also the 8th novel of the 10th day in Chaucer’s Canterbury Tales, retold by Elyot in The Gouvernor, and a source for Shakespeare’s Two Gentlemen of Verona. Note that the plays that are suggestive of Oxford were performed by those companies whose patrons were also his colleagues, Lord Chamberlain Sussex and Lord Admiral Howard, while the one title that falls outside this group was performed by a company whose patron was allied with his rival for the Court stage, the Earl of Leicester. Note that Mutius Scaevola was performed by the choristers who had just begun to study at the little school at Blackfriars created shortly after Oxford’s return from Italy. That Paul’s Boys was combined with the Chapel Children to perform a play about the kind of Roman hero that Shakespeare admired in his youth calls to mind the fact that Henry Evans, who “sold” the lease to the Blackfriars theater school to Oxford in 1583, was then assistant to Sebastian Westcott, master of Paul’s Boys. This was the same Henry Evans who became one of the directors of the children’s company that would take over the second Blackfriars theater in 1600. It’s interesting that the same Court calendar noted that following Oxford’s return from Italy, the Queen’s summer progress that year took the Court to Loseley, home of Sir William More, the Blackfriars landlord. Did the conversation include discussion of the need for a choristers school handy to the palaces? What was the reason for bringing the choristers from Windsor Castle to London when the London Court was already supplied with choristers from Paul’s? Since the whole Court was expected to participate in this perambulation through the countryside, it’s very likely that Oxford, Sussex, Admiral Howard and Sussex’s Vice-Chamberlain, Henry Hunsdon, soon to become the little theater’s primary patron, were also present at the gathering at Losely. Of the many plays performed by the boys at the little theater, only seven titles are known, and of these, only three are extant, so it’s interesting that all three of these are attributed to members of the University Wits, whom I identify as Oxford’s coterie at Fisher’s Folly. Of these plays, two attributed to his secretary, John Lyly, Campaspe and Sappho and Phao, and one to George Peele The Arraignment of Paris (137). There are clues that Marlowe’s Dido and Aneas was also performed by the boys during this period. The troubles that would bring down the school and its theater first arise in the record in 1580 when Farrant broke his lease by subletting some of the space he’d rented from More, either to raise cash or for some other reason. Since this was in violation of the original contract, More used it as a reason to sue him, at which point whoever was defending the patrons managed to keep the matter stalled in the courts until April 1584 when it finally ruled in More’s favor––though, it should be noted, not until the all important winter theater season was over. With both Frith, the Court’s dancemaster, and Lord Hunsdon, the Queen’s Lord Chamberlain, still holding leases to halves of the Parliament Chamber, the great hall was still in the hands of persons connected with the Court stage, and by extension, considering that these perforances had been made open to the public, the infant London stage. Those persons were Henry Evans, assistant to Sebastian Westcott, Master of the Children of Paul’s, John Lyly, servant to the Earl of Oxford, Oxford himself, and Ld Hunsdon, the Queen’s Lord Chamberlain and the Privy Councillor responsible for Court entertainment, who by then had accumulated leases to several properties in Blackfriars surrounding the Parliament Chamber. I suggest: 1) that the 1584 court decision forced Hunsdon, not to get out, but to make a deal with More; 2) that More, who was obviously ambitious to move up at Court, wasn’t about to give a great peer and Privy Councillor like Ld Hunsdon reason to dislike him, therefore: 3) the theater at Blackfriars continued to entertain the Westminster audience––at a level that failed to reached the record––until 1590 when Hunsdon’s lease ran out. Hunsdon asked for more time, but More refused, claiming that he needed the space for his family, clearly an evasion since as soon as he could he sold it to Dr. de Laune. He notes that the Children of Windsor ceased performing after Farrant’s death in 1580 and the Children of Oxford’s after 1584, while the Children of Paul’s continued to perform at Court until 1590 (159). In calling Blackfriars the first commercial indoor theater, I’m ignoring the fact that the little theater located next to Paul’s Cathedral had been commercial for some years in the sense that it operated chiefly on ticket sales, though probably only during festival times. The history of Paul’s is complicated and spotty, but it seems clear that once Blackfriars opened, it was superceded, and that it returned to importance after 1584 when Blackfriars was no longer open to everyone. More may have had his own reasons for allowing the theater at Blackfriars to continue. He did, after all, agree a few years later to sell the Parliament Chamber to Burbage for a whopping £600, (in today’s money, approximately £360,000) so that Burbage (and Hunsdon) could create a new indoor theater on a much grander scale than the little school stage. Surely More would have been aware that such a theater would mean a great deal more noise and traffic than was supposedly the problem in 1584. This suggests that noise and traffic was not the real reason for More’s effort to shut it down. Considering the nature of Gosson’s attack on the theater in 1579, and that More’s attack began the following year, it seems likely that the problem lay more with what was being performed than with noise and traffic. Did the adult actors use the stage? One more question has arisen from this examination of the origins of the first Blackfriars theater. Historians portray the theater as used only by the boy choristers under the direction of their schoolmasters. Far more likely from what we’ve shown above is a situation where the schools shared the stage with the adult actors of Burbage’s company under the direction of the Earl of Oxford. With this little stage so accessible by ferry to all the royal palaces, Whitehall in Westminster, Hampton Court a few miles past Whitehall, Greenwich just down the river, it seems more than likely that the adult actors used it as well, to rehearse, particularly for Court performances, and just as likely, to entertain the Inns of Court gents, for whom the little stage was created in the first place. No one ever seemed all that bothered by the boys in later years, it’s much more likely that it was only the adults, and the nature of their plays, that concerned the residents of Blackfriars. As I’ve argued elsewhere, history suggests that Oxford was inspired to write the first versions of several of the Shakespeare masterpieces following his banishment from Court in the early 80s. That so many have seen Claudius in Hamlet as a dark portrait of Leicester, suggests that an angry, frightened Lord Great Chamberlain was using the old Danish story to dramatize the rumor that Leicester, who hated Sussex as a rival and wanted him out of the way, had had him poisoned. Sussex was not a king, but to Oxford he was the father who had opened the door to his lifelong sphere of influence, a door that with Sussex gone, Leicester might close again, opening it instead to his client, Lord Strange. There were also unflattering portraits of Burghley and the Queen in Hamlet, though perhaps not quite so unflattering in the first version as they would become through multiple revisions. Probably shortly before his return to Court, Oxford tried to undo the damage with his polite portrait of the Cecils in Coriolanus: Burghley as Menenius, Mildred as Volumnia, and Anne as Virgilia. It’s not likely that Burbage’s move to acquire the entire Parliament Chamber in 1596 as a winter stage for the Lord Chamberlain’s Men was a spur of the moment idea. More likely it grew out of their unadvertised use of the Parliament Chamber to reach the West End audience from 1576 until 1590, with the final five years operating more or less as an underground theater, perhaps by invitation only. Why go out on a limb like this? Once again to fill a vacuum. The London theater was increasing in popularity and influence. The most important audience for the Court patrons and their companies was the West End. It makes no sense after the increase in popularity of the Blackfriars theater, that from 1584 to 1610 when the King’s Men were finally allowed to begin using the Parliament Chamber, there was no adult venue closer to the West End than the little theater at Paul’s and the theater inn, the Bel Sauvage, both under the control of the City. However conjectural our scenario, one thing we can be certain of, that Oxford, Hunsdon, and Burbage did not simply resign themselves to the seeming loss of access to the Westminster audience for twelve years from 1584 to 1596 when they acquired the Parliament Chamber, because that makes no sense at all. Request permission to reproduce the map of Blackfriars vicinity in up-coming book. Is there a fee? No, but a credit would be appreciated.